Hello! Welcome to Day 2 of the blog hop to celebrate the BRAND NEW June release at Lil' Inker Designs! 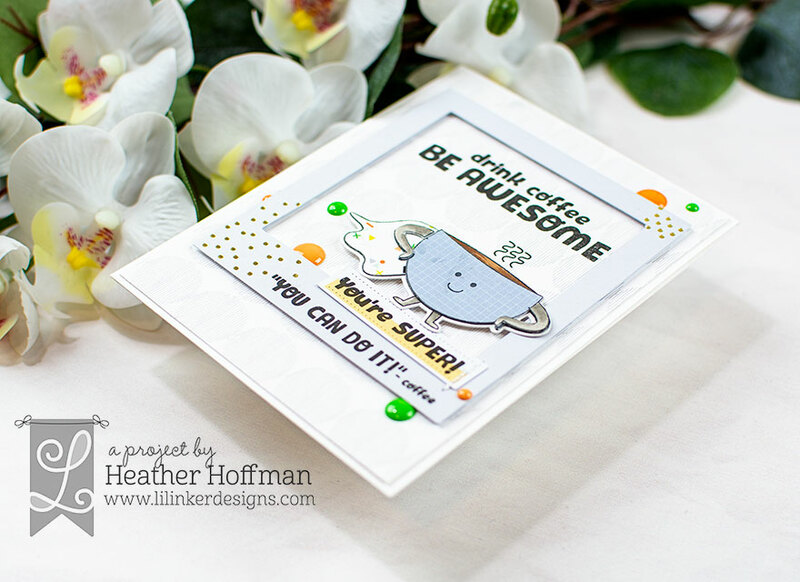 There are SOOOO many incredible new stamps and dies in this release - and if you like coffee, kitties, or babies - you are going to LOVE this release!!! You can find the entire new release HERE! 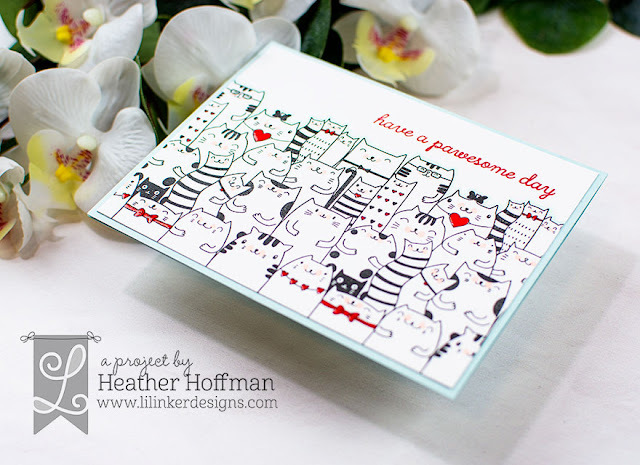 This card uses the ADORABLE new Cat Hugs stamp set - isn't it a fabulous huge image?!?!? I love that you can fill a card front, and don't have to mess around with masking either! I kept my card very simple - just adding a touch of color with Copic Markers. The coordinating Cat Hugs dies are super clever though - I plan on using them soon! They allow you to cut out the top edge, and also cut out the kitty paws on selected cats in such a way that you can tuck in some of the many accessories included in the stamp set. How cool is that?!?!?!? I stamped the sentiment in red at the top, trimmed my panel slightly and mounted on a soft blue card base. Finished off with a touch of Crystal Glaze on the glasses, hearts, and bows for a bit of fun shine and texture. This is a nearly one layer card - and isn't it SOOO fun?!?!? 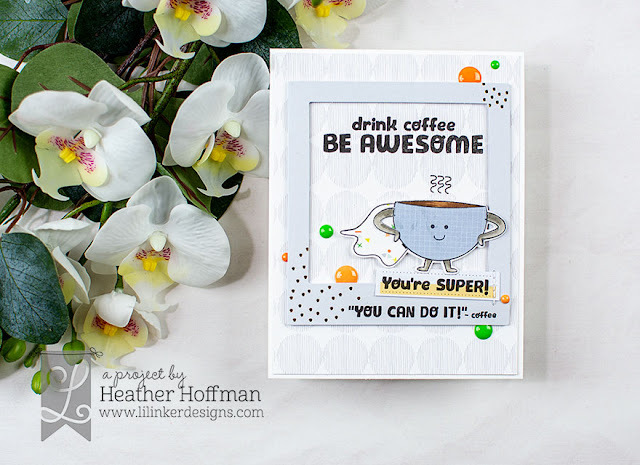 Next up - I love this super cute new Super Coffee Stamp and Die Bundle - SERIOUSLY fun! I paper pieced the coffee cup with a combination of pattern paper and Copic colored bits. So many possibilities for this image! Layered it on some pattern paper and the premade frame from Pinkfresh Studio - and stamped the sentiments around and on the frame. Finished off with a pop of color from some enamel dots. Now, I think I can handle that Cat Hugs stamp set with the way you colored it. Not as much intimidated.-Maria Giselle B.
I adore your simple version of the Cat Hugs stamp. The b/w with a touch of red and a bit of dimension using Crystal Glaze equals perfection. Love the idea to paper piece portions of Super Coffee... I really like the look but always forget to use it on my cards. I love your coloring choice on the cat crew ! Keeping them black and white gives so much strength to your red accents ! And your coffee cup is simply adorable and I also love the color combo. Love these, Heather. Love the coloring on the kitties. So cute with the black and white cats and the pop of red. I like the paper piecing and framing on the super coffee card. Oh my goodness! Love the black and red cat card, such a stunning effect with a minimum amount of coloring! Beautiful! coffee cup is really fun. Love the whole design of that card. Your cards are adorable and love how you kept the kitties card simple with just a little coloring! I just love the red and white cats. What great colour choices. My favourite card I have seen so far with this stamp set! So cute! And the paper pieced coffee cup, what a great idea! Those cats are just too cute! Love how they can hold onto items. Your card is adorable with the splash of red! How cute are those cats?! Love them! I just love these cats! They are adorable done in black, white and red - you did an awesome job! Love the kitties.. my favorite is the plaid cover plate. I would feel so lucky to win such a fabulous prize. So generous. So cute! Love the kitties & the coffee! Love these cats! :) They are so cute. These are so sweet! Love the cat scene you created! I love how you colored the kitties cats, looks so original and beautiful! Super-cute cards! I'm especially loving all the fun coffee-themed products. Beautifully and cleanly executed cards! The color combination on the first is so striking, love how the light blue softens it a touch. The second card is so fun and happy, another fabulous color combination and that super hero cup -ack! Wow! Super adorable cards! The new release is really fabulous! I'm so in love with the kitties stamp I must have it. Lovely cards! Fantastic cards! 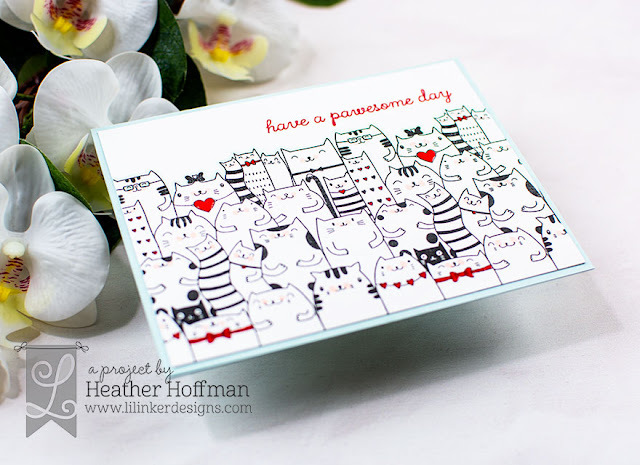 I love the black and white with some pops of colour on the kitty card! Such great cards! The cats of course are my favorite. The Black & White contrast with a pop of color is amazing. The super hero and baby onsie cards are also adorable. I'm in love with the Cat Hugs set! Love it in b&w with red accents! Awesome cards! Your cards are awesome. Love the kitties and Super Coffee. Your kitties in B&W with pops of red is pawsome!! 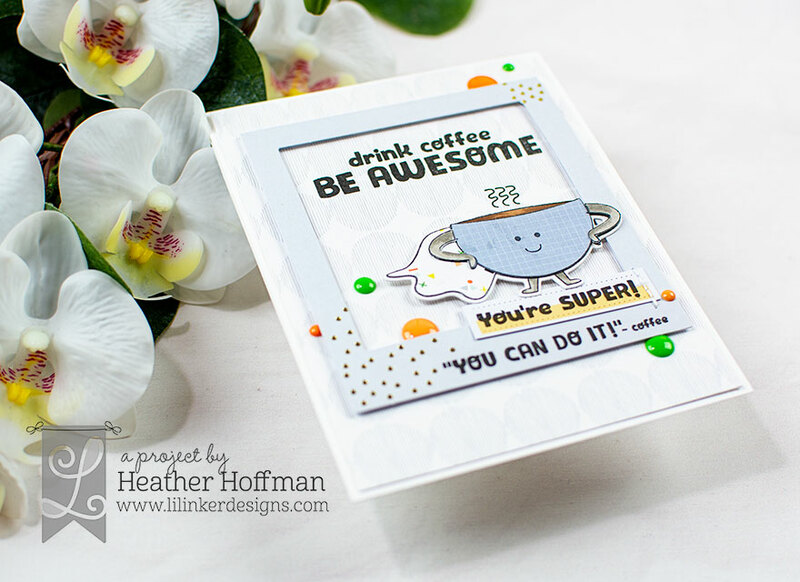 Omg... those kitties... and even with just that little bit of coloring makes quite an impact... and I do love that little coffee hero... he is so adorable and so much fun to create with! Love your creations! I love the black and white cats with a little pop of color. So cute! 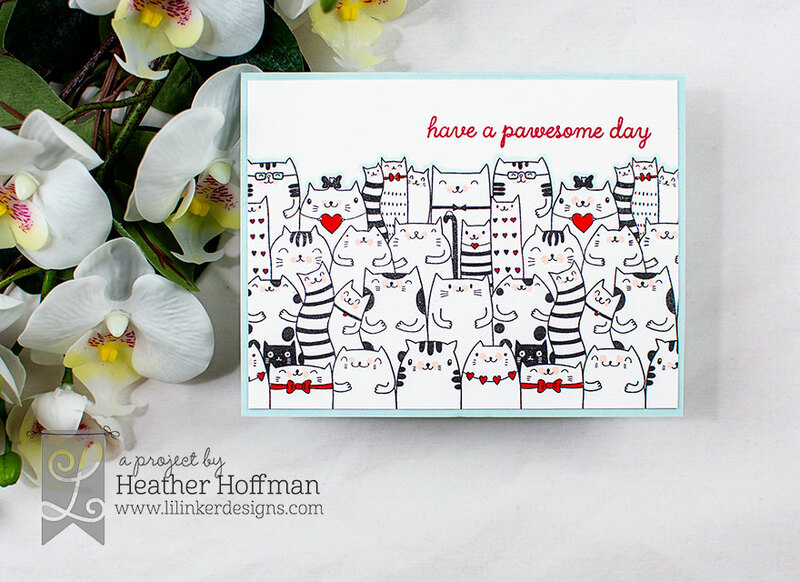 Love your cat card - the red, black and white color combo is my go to color combo. Great cards! I really love the black and white cats with a pop of red. Such a good colour combo. I think I'm in LOVE! That cat stamp is super cute...must have! I'm not a cat person but these caught my eye. Love the use of the hearts for some of them. LOVE LOVE LOVE your card! The caped cup and the multi cat stamp and die set are my favorites from this release.